The proper way to prune cedar trees may require you to cut back certain branches depending on the size of the tree. 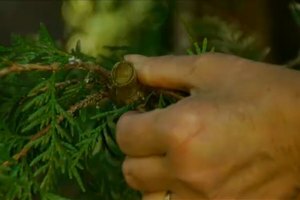 Properly prune cedar trees with help from a landscape designer and horticulture writer in this free video clip. Hi, I'm Marci Degman, the aspiring gardener. And today, we're going to talk about the proper way to prune a cedar tree. Now, I want to start by showing you what happens when you prune a branch on a cedar. Now, you can go in and do little, tiny bit of sprucing and it may not show. But in this case, I had to cut this branch back. Because it was out too far into the driveway. But I wasn't quite ready to limb this plant up. Eventually, this branch will come up and probably soon. But I wanted you to see what happens.And see, the difference between a conifer, is it grows back differently than other plants. You can cut a fruit tree or a magnolia tree. And the branches will either, new branches will come out, or you'll have new wood on the same that you've cut before. But what happens here, is you don't usually get a new branch, where you cut on a conifer tree, like this cedar, this is a Western Red Cedar. So, here, where I cut, it is still, it's dead. And so, I have some really odd looking growth around this spot. So, this will never look the way it should. So, in this case, it was a temporary type of pruning. But don't do that, you don't want to do that with a cedar tree. Now, if you do need to cut a small piece off, of it, just like one little branch, like this. That you don't care if it returns, you can cut it. 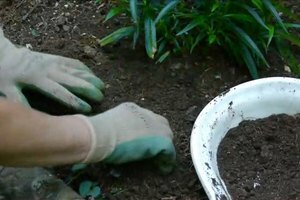 And you can pretty much do that at any time, small pruning like that, any time of the year. And I'm just going to cut that off, because it's kind of in the way. So, it's easy to do, it's an evergreen, so you can't really wait till it's dormant, because they're never dormant. They may not get as much new growth in the winter, because the roots are growing. So, it might be better to do it in the fall, or early winter, or early spring. But they're evergreen, so they never stop growing. O.k., so, that's, that's really kind of what happens when you go cutting back a branch, that's not really the best way to cut a cedar tree. So, generally with the cedar tree, unless you have dead limbs, which you would always want to remove. The only thing that you really want to do, is expose the lower bark. And because the limbs do become pretty weepy and they get in the way. You'll want to take lower limbs as the tree gets older and it starts to look appropriate. Now, here I've got a lot of new growth sprouting off the lower part. Even though that's kind of unusual, and it's kind of neat looking, it isn't really that attractive. When you want to see the trunk of the tree. So, this is the kind of stuff that you do want to prune away. Because I don't really want a bunch of lower limbs developing. So, this is what I'm going to do, up to about where these large limbs are. And then, as the tree gets a little bigger, I'll take some actual limbs off, and use a saw to do that. And that's how you properly prune a cedar tree. Why Is My Cedar Tree Dying? Are Cedar Trees Poisonous to Dogs?